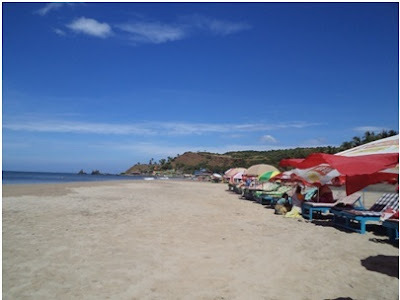 Hi, just arrived back home in Candolim from spending four days in the North of Goa at Arambol beach. 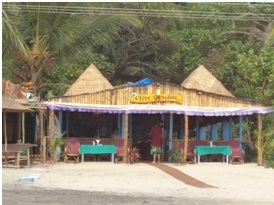 Accommodation is cheap and ranges from bamboo beach huts to basic rooms. 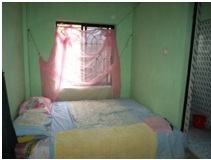 Most rooms having a fan, and lucky for us a hot water shower. 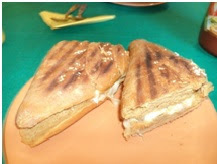 The German bakery or backery as they call it not only offers a great value for money breakfast, but also an array of sandwiches, pizzas, and pastries. We are always glad when the German bakery starts up; this is the only bread we enjoy. Sliced bread in Goa is rather like Danish bread, no body to it what so ever, and usually has a sweet taste. 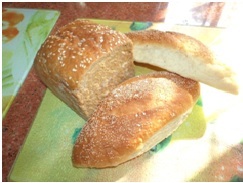 The Goan bread roll is passable, but the white roll is very doughy and very sweet. Cheese and mushroom toast, is always a must for me for breakfast with a cup of milk coffee. 60 rupees (less than one pound). Below is the simple breakfast menu, check out the spellings. 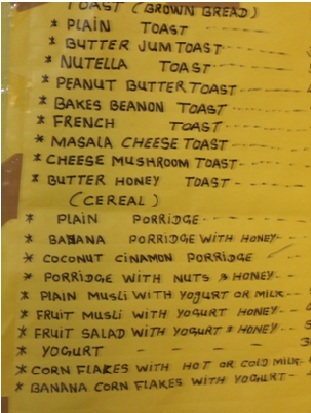 Always a great joy reading a menu, I love the ‘bakes beaon toast’ or a favourite mushly for muesli. On this stay I must say the best meals that we enjoyed the most was taken at the ‘Olive Garden.’ Great food and great service. 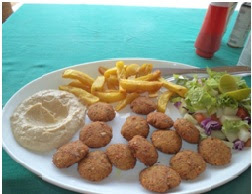 Chickpea spicy fritters, with hummus, pitta bread, and chips 130 Rupees (£1.60). John had already taken half my chips before I got the camera out! 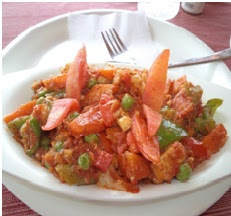 Tandoori cottage cheese and vegetables, green and red peppers, mushroom, tomatoes, and onion. Chips, mixed salad and boiled rice. Far too much for one, we share with two roti. 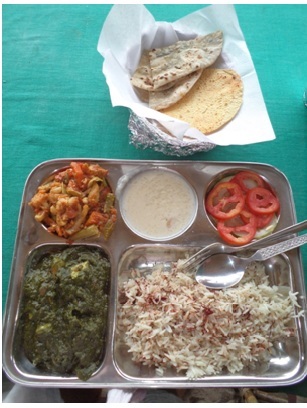 130 rupees (£1.60) A VALUE MEAL. 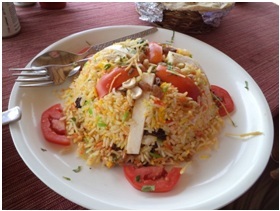 Veg Jalfrazi and Veg Biryani rice. 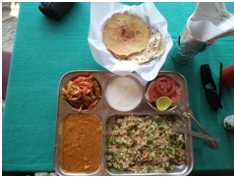 So as you can see the choice of food is endless, cheap and we have the added knowledge that every meal is carefully presented, and pride is taken in all that they cook. 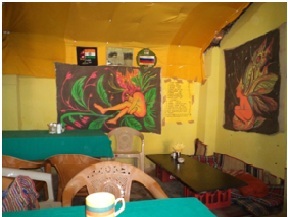 What we like about the Olive Garden is the fact that back in Himalayas, they have an Italian restaurant and hotel and so when the season starts in Goa, one of the managers and a team of his workers come and grace us with excellent food. 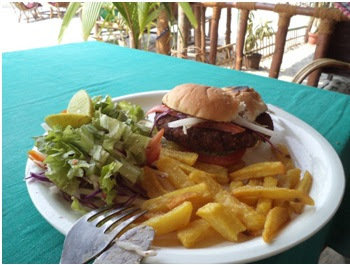 Looking forward to enlighting you more of the delights of vegetarian food during our stay in Goa. Bye for now, Joanne Rawson. 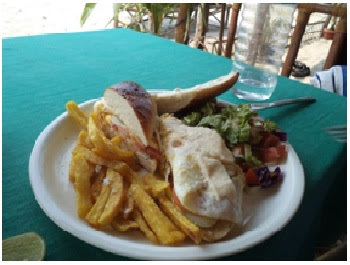 Jo Rawson is a British ex pat currently living in Goa with her husband John, She is the author of "For Better, For Worse"
Thanks Jo for sharing your experiences of food in Goa. 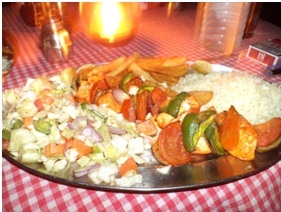 I must say, the food looks wonderful and I am very jealous as it's much nicer than what's around for vegetarians over here!! Pumpkin Risotto- "Risotto di Zucca"
This work is licensed under a Creative Commons Attribution-NonCommercial-NoDerivs 3.0 Unported License. Views and opinions expressed in this blog are my own and are not intended to cause harm. Please inform me if you wish to use images or words from this blog. The Author is not responsible for, nor will be held liable for blog comments or content of external websites. Vegetarian Experience 2015. Powered by Blogger.